At Monarch Media, we know how important it is for our technical solutions to work for an entire organization, regardless of its distribution across a single office, multiple states, or different countries. We also know that once a solution is implemented, it should maintain its relevance for years to come. These two considerations are part of what gives a project real staying power in today’s market. Both of these ideas were realized in a recent project Monarch completed with Alpha Gamma Rho (AGR) Fraternity and its network of 71 chapters, each containing their own nationwide systems of collegiate members, officers, alumni, advisors, and mentors. When AGR’s home office put the call out for an innovative and modern approach to updating their learning management system (LMS) and new member development, Monarch partnered with Vivayic, Inc. to do just that. AGR’s previous system had run its course and it was time to modernize. The first step was to identify the LMS that could handle this responsibility. In this case, the choice was clear—Moodle. As arguably the most popular and widely used open-source LMS, Moodle is constantly being updated to meet the needs of its global community. It offers staying power for an organization with an ever-growing community of users. As in any kind of distributed organization with 50,000+ members, knowledge-sharing is invaluable. AGR’s document library, course catalog, and officer directory are used by approximately 3,000 users per month and need to be user-friendly and outfitted with the latest technology. The document library (or “toolbox” in this case) allows for easy navigation of files and training materials grouped by role, course, and fraternity chapter. 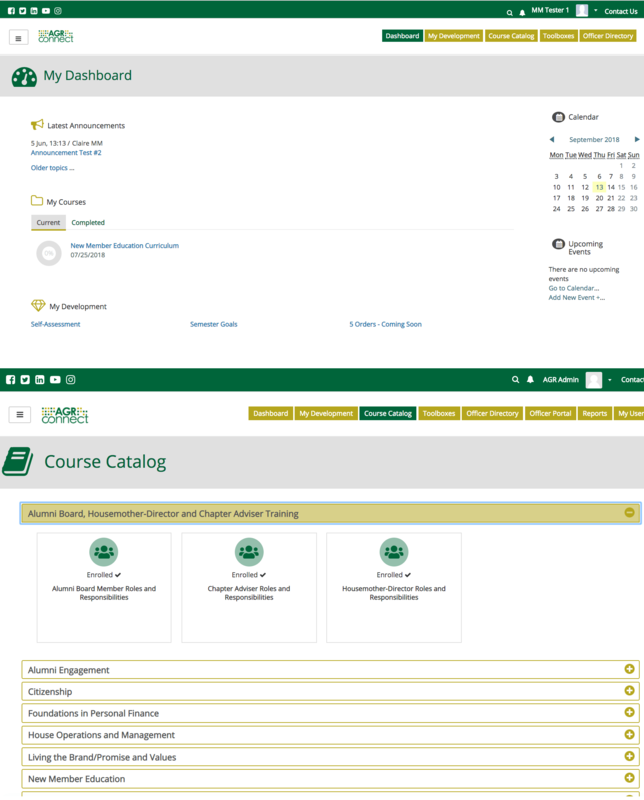 The course catalog provides ongoing access to orientation for new members and to self-paced tutorials for personal development by all members. The officer directory allows users to connect with each other by providing contact information such as phone numbers and email addresses. Each of these areas allow members to quickly navigate to the content and resources relevant to them. Another area where collaboration was key to this project was in designing a personal development tool that allows new members to not only identify which personal competencies they want to develop, but also gives them an opportunity to work with a more seasoned fraternity member as their mentor or “big brother.” Monarch took an innovative look at how the Moodle LMS is typically used and worked with AGR to create a unique self-assessment to aid users in identifying their development goals. Users are then able to share the results of their assessments with their big brothers to allow for a collaborative goal-setting conversation. As decades-long experts in the eLearning community, Monarch Media is consistently on top of the latest tech trends to keep our products state of the art and relevant for the long-term. Whether you are looking to develop a new eLearning course for your business, you are in need of new ways to collaborate with your colleagues, or your existing LMS could just use a refresh, we are uniquely qualified to find the best solution to meet your needs. Our portfolio is always expanding, so be sure to check back often for examples of our latest and greatest offerings. We are just a brainstorm away from unlocking your organization’s eLearning potential with a solution that will stand the test of time. We are ready to help you discover the power of collaboration and learning that an LMS can provide to your organization. For more information on how Monarch Media can assist, please call, email, or visit our website.